have you had a great start so far into the new year? Can you believe it is already 2015? I remember vividly the time when we started writing a 20 in the beginning of our years. Crazy. Anyways, I already told you about all my big plans for 2015 in my resolution post. And I also know that it is easier to break up big goals into smaller tasks to actually accomplish something. Have you already lost your motivation? Why not join in Elisa’s round up. Every month there will be a new set of goals (in my case a contribution to the overall yearly goals). We can do it if we do it baby steps. I’m in, are you? I soooo need to bite my tongue sometimes!!! Great idea with walking parts of your commute. I’ve been doing it for a few months (straight after work) and I find it a great way to distress. Yeah walking a bit after sitting in the office is so great! I did it in September already and felt good. Now let’s make a habit. andreea recently posted…Happy new Year! meine Pläne sehen ähnlich aus, mal schauen, ob ich das umsetzen kann. ich drück die Daumen, dass deine Pläne Erfolg haben. Omg #3. I have been holding on to all of my post baby number 2 clothes. And he’s two. This weight better come off this year or I won’t have a choice but take on your challenge! Sounds like you’re going to have a great start to 2015! Jai, let’s tackle this. Together we can do it! 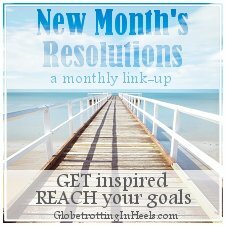 Breaking up your resolutions into smaller monthly goals is a great idea! Makes it more manageable! Yes I really like this idea too and hope it works out great. I have made the resolution to comment more on blogs, not just like the Instagram photos. I want to appreciate the posts more. I like your resolutions. Not being bitchy…yes, I should have that on my list too. But sometimes…..
Good thing to comment more on blogs. I will try to keep it up too once the crazy everyday life starts again. Good luck to you too! ich wünsche dir ein fantastisches neues Jahr! Sie kommt nur circa 30 Teilen pro Saison – also 3 Monate aus. Ich weiß nicht mehr wie ich darauf gestoßen bin, aber ich finde es unglaublich faszinierend und inspirierend. puhhh 30 Teile für 3 Monate… Davon hab ich auch schon mal gehört… Vorstellen kann ich es mir aber nicht so genau. Ich schau mir den Blog aber auf alle Fälle an.